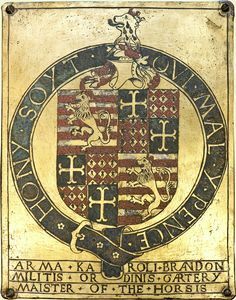 King Henry VIII had few close friends, and Charles Brandon, Duke of Suffolk, was his closest throughout his life. Brandon’s father, Sir William Brandon, was standard bearer for Henry Tudor at the Battle of Bosworth Field - and is thought to have been killed by King Richard III on 22nd August, 1485. Young Charles Brandon was brought up at King Henry VII’s court and became a favourite of the king as well as a childhood friend of his second son - the future King Henry VIII. Brandon's military exploits in France mostly ended in failure, although his prowess as a champion jouster made him one of the most popular Tudor knights. Charles Brandon led the jousting at the meeting of King Henry VIII and King Francois I of France at the Field of Cloth of Gold in 1520, and in 1523 commanded the English army in an attack on Calais. He was High Steward at the wedding of Henry VIII and Anne Boleyn in 1533 and was rewarded with land as part of the dissolution of the monasteries. Charles Brandon lived a full and active life right up to the day he died on 22 August, (by coincidence on the anniversary of the Battle of Bosworth, the same day as his father) 1545 at 4 o’clock in the afternoon. He'd attended a meeting of the Privy Council in Guildford the day before his death, and his fourth wife Catherine was at his bedside with his daughters Frances and Eleanor to comfort his last hours. He'd asked for a modest funeral and to be buried in the college church of Tattershall in Lincoln. King Henry decided instead that Brandon should be buried with full honours at St George’s Chapel in Windsor Castle, where he had been made a Knight of the Garter. 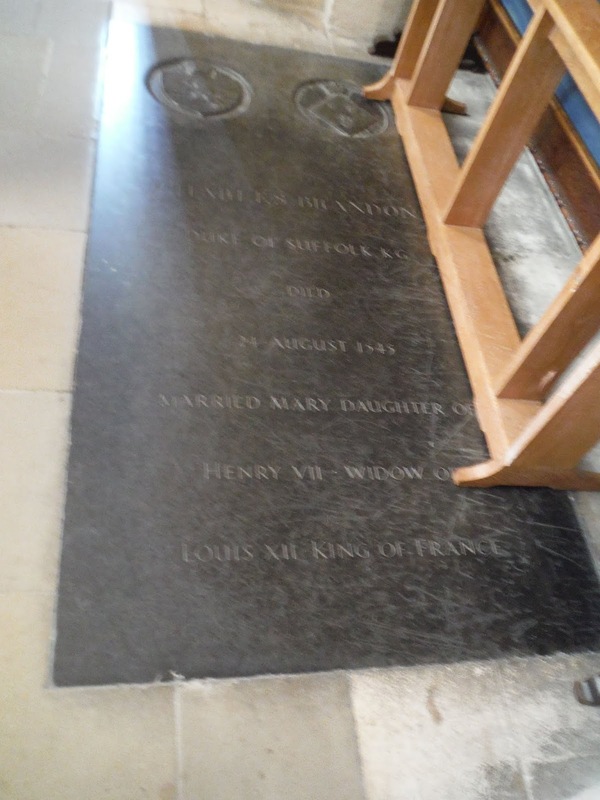 I visited Windsor Castle as part of the research for my new book, and discovered Brandon's tomb in the fourth bay of the south quire aisle, near the south door, partly covered by a wooden bench seat and under a life-sized portrait of King Edward III. It seems that it was originally as modest as he would have wished, but the chapel records show that in 1787 it was 'ordered that leave be given to lay a stone above the grave of Charles Brandon Duke of Suffolk, according to His Majesties directions'. The resulting stone was put in place during the repaving of the quire aisles and nave. The simple inscription states only that Charles Brandon married Mary, daughter of Henry VII, widow of Louis XII of France. I also discovered that the jousting helm mounted on the wall adjacent to his tomb is not a funerary helm and is not thought to have any connection with Brandon. 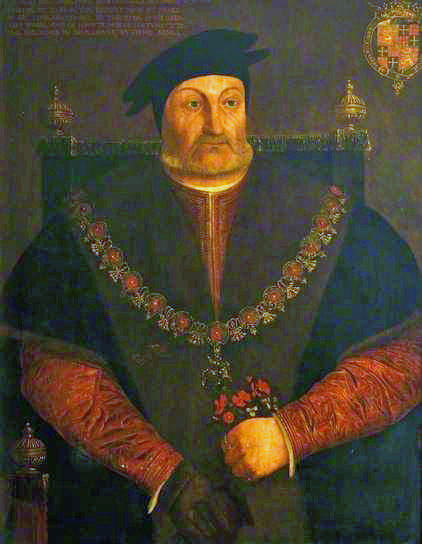 Brandon was sixty-one when he died, and fortunately unaware that both his young sons, Henry and Charles, would die within an hour of each other of the sweating sickness on the 14 July, 1551. I think Brandon would have been amused to know he lies alongside King Henry VI - and a few yards from the equally unimpressive tomb of his lifelong friend and benefactor, King Henry VIII.